The time zone in Germany is Central European Time and Central European Summer Time. Daylight saving time is observed from the last Sunday in March to the last Sunday in October. The doubled hour during the switch back to standard time is named 2A and 2B. Metropolitan France uses Central European Time and Central European Summer Time. Daylight saving time is observed in Metropolitan France from the last Sunday in March to the last Sunday in October. With its overseas territories, France uses 12 different time zones, more than any other country in the world. Time in the Czech Republic is Central European Time and Central European Summer Time. Daylight saving time is observed from the last Sunday in March to the last Sunday in October. The Czech Republic has observed Central European Time since 1979. Until 1993 when Czechoslovakia was separated into the Czech Republic and Slovakia, they also had Central European Time and Central European Summer Time. After the summer months, time in the Czech Republic is shifted back by one hour to Central European Time. Like most states in Europe, Summer time is observed in the Czech Republic, when time is shifted forward by one hour, two hours ahead of Greenwich Mean Time. Most areas in North America and Europe, and some areas in the Middle East, observe daylight saving time (DST), while most areas of Africa and Asia do not. 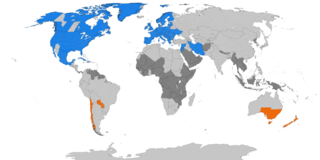 In South America, most countries in the north of the continent near the equator do not observe DST, while Paraguay and most of Chile do. The practice of observing daylight saving time in Oceania is also mixed, with New Zealand and parts of southeastern Australia observing DST, while most other areas do not.